The top cities to start or expand your rental real estate empire. Success or failure in rental real estate hinges on the local market where you buy and rent your investment property. Conditions like rental rates, home prices, vacancy rates, and more can vary from city to city, and even neighborhood to neighborhood. Below, you'll find three of the best cities for landlords, along with an explanation of the logic that drove this list. The best cities for landlords will have conditions that offer the greatest chance of consistent investment success for your rental real estate property. A rising tide lifts all boats, after all. To determine this at the city level, we can assess the potential for high returns on investment over the long term. That means relatively low home prices, lowering the initial investment capital you need to purchase the property. Home affordability is also important, as taxes and other recurring expenses can quickly erode your returns. We must also consider rental rates. Your cash flow projections may work with today's income projections, but a drop could easily send you from the black to the red. We want to find areas with rising rental rates, and underlying economies to support continued increases. And speaking of the local economy, that's important for another reason, as well. It's critical that you find creditworthy tenants who will pay on time and take care of your property while they live in it. A city with a growing population can help bring in new prospects, but those tenants will need good jobs both to bring them to the area, and to keep the rent checks paid current. Atlanta is a major regional economic center in the southeast, home to numerous multinational corporations from the airline industry to consumer goods to media. Atlanta is also a pretty inexpensive place to live. The city and surrounding metro remain below the national average for home affordability, though the gap has narrowed recently. 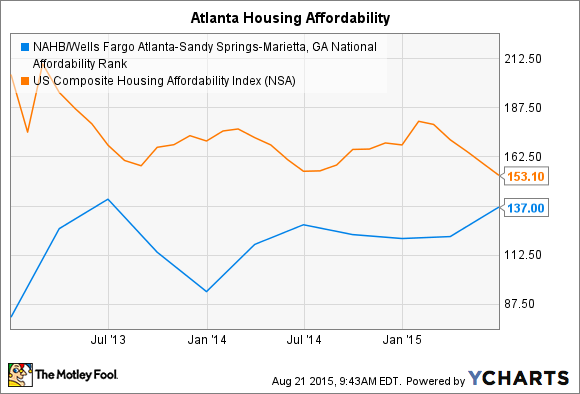 NAHB/Wells Fargo Atlanta-Sandy Springs-Marietta, GA National Affordability Rank data by YCharts. Rental rates in greater Atlanta have seen a nice increase during the past three to four years. These increases counter the rise in home affordability seen in the chart above, and also point to the city's potential for rental profits, as leases can be increased over time. 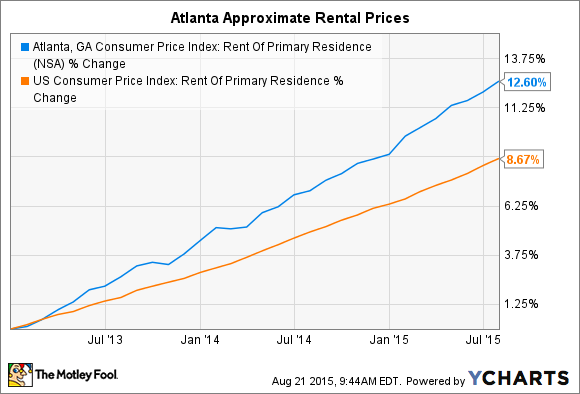 Atlanta, GA Consumer Price Index: Rent Of Primary Residence data by YCharts. The unemployment rate in Atlanta was 6% as of June of this year, above the national average, but much improved from the 10%+ rates seen in the area as recently as 2011. Compared to Atlanta and the rest of the U.S., it's downright cheap to buy a home in Flint, Michigan. 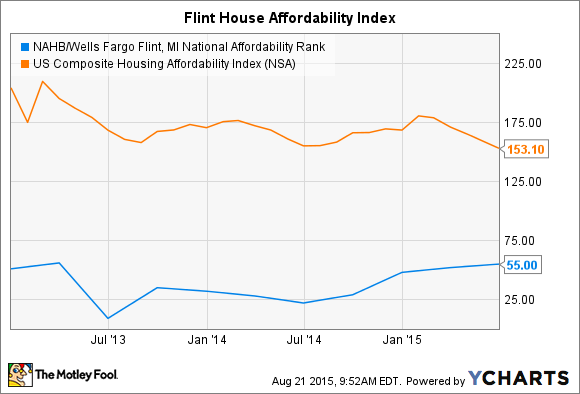 NAHB/Wells Fargo Flint, MI National Affordability Rank data by YCharts. Rental rates in this industrial city are not growing quite as fast as the rest of the nation, but rates are increasing. Plus, when it's this cheap to buy, the math still works out quite well for your return on investment calculation. 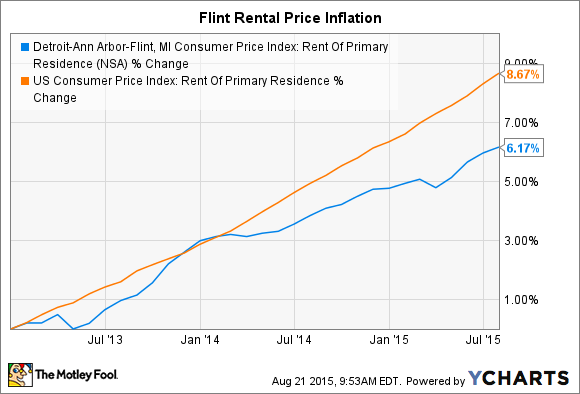 Detroit-Ann Arbor-Flint, MI Consumer Price Index: Rent Of Primary Residence data by YCharts. Flint, unfortunately, is not without its flaws. The reason home prices are so inexpensive is a relatively weak local economy. However, the economy has shown solid improvement of late. Along with the rest of Michigan, the decline of the U.S. auto industry during the past few decades has taken its toll on Flint. The financial crisis, and the conditions that led to the auto bailout, only made things worse. Flint's unemployment rate peaked at 16.9% in July of 2009. Since then, though, the economy has shown sprouts of hope. The unemployment rate is down to 6.3%. Property values have stabilized, and in some areas are appreciating nicely. Many Flint locals today are optimistic about the city's future, a marked change from just a few years ago. Heading back to the Southeast, Greenville, South Carolina may be the top city for landlords in the entire country. One problem every landlord faces is vacancy. The mortgage still must be paid, the grass cut, and the lights kept on, even if there isn't a tenant living in the house for a few months. Landlords in Greenville face that problem a lot less than the rest of the nation thanks to a tiny 4.4% vacancy rate in the area. That's 32% lower than the U.S. average. 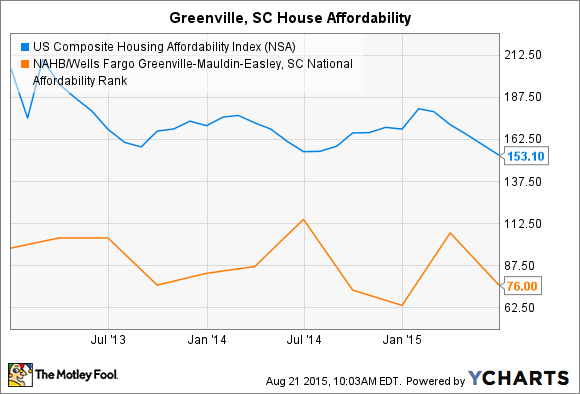 Houses are also quite affordable in Greenville, with the housing affordability index well below national averages. US Composite Housing Affordability Index data by YCharts. The Greenville metro is also home to a diverse and mature economic base. The area is home to major operational centers for BMW, Kyocera, Michelin, GlaxoSmithKlein, and other large companies. This investment from the corporate world creates jobs, spurs growth, and provides stability. It's also a driving reason behind Greenville's impressive population growth. The metro grew 32% from the 2000 census to the 2010 census, one of the faster growth rates in the country. More recent data indicates that Greenville has continued that strong growth since 2010, with no signs of slowing down. Looking at cities and metropolitan areas can be a good start in your quest to become a landlord or expand your real estate empire. The city provides the overarching economic environment that will shape home prices, rental rates, and the quality of potential tenants. Within each city are micro-economies and potentially dramatic differences in your investment options. Take the time to visit the city where you plan to invest. Visit the property. Drive around the neighborhood at different times of day. Try out the local amenities. Ask yourself if you'd rent in that area. In many cases, your boots-on-the-ground instincts will tell you a whole lot more about your chances for success than any economic statistic ever could.